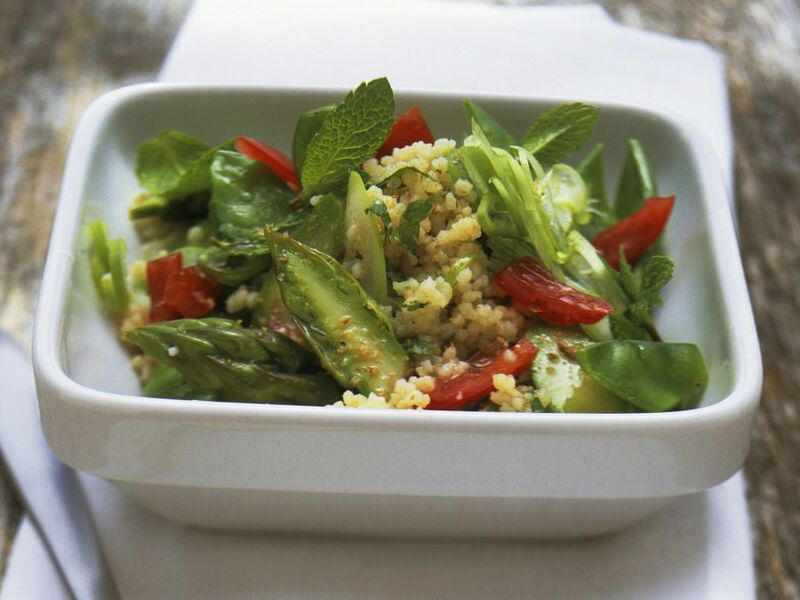 Couscous and Asparagus Salad with Mint - Crisp and vernal: simply delicious! 1 Cook the couscous in salted water according to package directions. 2 Rinse the asparagus, peel the lower third, and cut off any woody ends. Halve the spears lengthwise, and cut crosswise into 4 cm (approximately 1 1/2 inch) long pieces. 3 Rinse and trim the snow peas, then blanch for 2 minutes in boiling salted water. Remove from the water and drain. 4 Rinse, trim, and julienne the peppers. Rinse and dry the mint. Remove the leaves, and set aside some for garnish. Finely chop the remaining leaves. 5 Rinse, trim, and slice the scallions. Peel and chop the garlic. 6 Heat the oil in a pan. Cook the garlic over medium heat until soft. Add the vegetables, sauté for 2-3 minutes, and season to taste with salt and pepper. 7 Fluff the couscous with a fork. Mix with the vegetables and chopped vegetables. Add the lemon juice, and season to taste with cayenne pepper. Garnish with the whole mint leaves, and serve.